Johnson & Johnson One touch Select Test Strips can make sure that you have the best hold on your blood sugar levels. 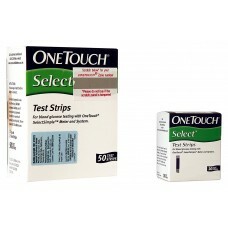 The strips are perfectly used by people who have diabetes and can ensure that you get the perfect care at your home. • Strips are made from high quality material which absorbs blood easily. • They are compatable with Onetouch Meters and can provide you accurate results. A	Expiry Date of the product is mentioned on the box as well as on bottle. Make sure that you buy a product which is no expired. A	Yes, The box comes with the code key and thus the strips should be only used on one device.